Today we're going to try a sort of gallery hybrid, with a few hi-res photos available below the "traditional" DOTS stuff. You'll definitely want to get a nice close look at this fine piece of Early Malaise Era hardware from the folks at Dearborn. I used to be indifferent to the '70-76 Torinos, but in recent years I've really come to appreciate these cars. I saw three of them at the Pick Your Part in Hayward recently, which was sad, but you still see them on the street as well. Judging by the exhaustive detail in the Torino page on Wikipedia, this car doesn't lack obsessive fans. Chrysler had soft Corinthian Leather, sure, but Ford wasn't far behind with their buttery Michigan Vinyl. Power was way down for the '74 Torino; the 302 was the base engine, but you could get a gruntin' 460 with a depressing 215 horses for 245 extra bucks. The '74 was on the weighty side at 3500 pounds, too; those monstrous bumpers sure didn't help matters. But still, this is a pretty decent-looking car. Very American. What it really needs is some wheels and tires that fill the wheelwells better. Plus it needs to be lower to the ground. There we go! The NASCAR look definitely works for these cars. 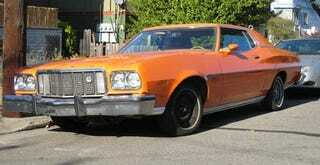 Yes, Unser's Torino was a '72, but they're pretty similar. Now those are some extremely 70s-looking seats, eh?